You are not logged in. [Log In] ETS Forums » Forums » The Survival Forum » Around The Campfire » The UK??? I know very little about the U.K. and have never been there, but my son was in Scotland sight-seeing and doing Outward Bound Training for 5 weeks this summer. He said the country was very scenic and the people were terrific everything was great, except for the weather. It rained for at least part of every day except two! He is right now canoeing the Nahanni River in Northwest Territories under nothing but sunshine for the past week; wish I was there. The Stone is still wet.!! 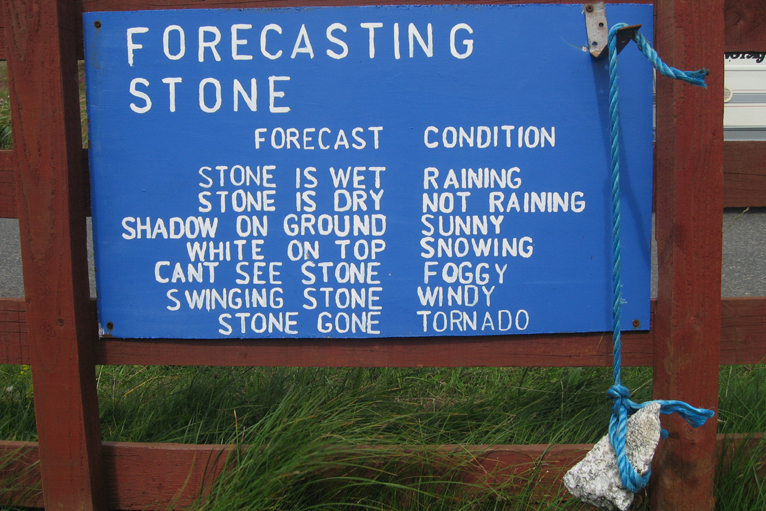 My son entered a public speaking contest a few years ago with the topic " Nature's Weather Signs", he ended the talk with an example of the "Weather Rock" and made it quite far in the competition. He got the idea from a similar stone that hangs in front of this Gun Shop in central Ontario. Thanks all for your info. Believe it or not its helping the decision process. I was born and raised in Stoke-on-Trent which is a wee bit south of Leeds. I have friends up there still, not a bad place to be, but given the choice of where you are now and Leeds, I wouldn't even get on the plane. Schools are very ethnically diverse, your kids may have class's in Hindu, Urdu and or Croatian. If you rise with the sun, don't count on being on time for work. Grey will be the norm as will the cold relatively speaking. Transport is a nightmare unless you live close to your work, in which case you'll be miles away from anything else. I would like to make a mention of salary, really study the package your company is offering, the cost of living in the UK is extortionately high. Swamp Donkey, did you mean Elwood Epps? Yes, I shop at Ellwood Epps often and monitor their used gun rack online daily. The shop has changed a lot since the new owners (the Winkel Family) bought it about 15 years ago. As a kid I remember it as a dark, cluttered place with stacks of guns and equipment, it was terrific. It is now still a great place, but things are more organized and there is a better selection of modern firearms and material. This place is still your classic gunshop, nothing like a big box store. Sorry to divert your thread about moving to the UK toward gunshops Kris. You live in a beautiful place now, there must be some serious incentives to have you considering moving to the UK? No worries... dicussion is dicussion! And yes to the incentives. Basically, i'd be in darwin's number one position if the verbal offer turns into the official offer and i don't take it. Leeds is now pretty much England's second city a lot of banks/finance companies moved there from London. Like any big city there are areas of crime/poverty/drugs/squalor - but you aren't going to be living in them. There are also lots of areas that look dirty and run-down but are perfectly safe - remember it's been a heavy industry city for 200years and it takes a while for the smoke to wash off. Most of these fine but dirty victorian buildings will have been turned into wine bars / starbucks by now. Assuming they aren't paying you minimum wage you are going to be living in a small town/village in the countryside north of Leeds. Just lookup tourist pictures of 'North Yorkshire' to see what this is like. Yes it's going to rain more than in the Caribean but there are fewer hurricanes. Leeds (and Bradford - the city it now joins) have a large Pakistani and Indian community. Most of them are 2nd/3rd generation of people who came to work in the linen industry in the 50s. Assuming they are terrorists is like assuming anyone black in Barbados must be an Uzi carrying LA gangsta. The main difficulty (especially in smaller villages) is the language - you might have to study "last of the summer wine" unless Rosetta does 'yorkshire for beginners' tapes. No probs... up for the challenge of language. I work with some people from the north, and lets just say after a few years i'm getting the hang of it and can handle my own. It'll be different if you drop me in the middle of a pub, i'm sure of it! Would anyone here recommend any villages? I have an idea for a few, but curious to the rail times from some of the villages to Leeds center.